Where can you find the best bathtubs? That's an important question to ask yourselves when deciding on a romantic getaway. Because when it comes to bathtubs, bigger is better. The best bathtubs —those with room for two, and perhaps even a private view—allow for long, lingering soaks together. They're a perfect prelude to romance. While big showers can be great watery fun, their insistent spray encourages quickies. Big bathtubs, on the other hand, inspire a slow, languid buildup to passion. For that reason, it's always a disappointment when visiting a reputedly romantic hotel, peeking into the bathroom, and finding a tub sized for an overgrown toddler. To ensure you won't meet that fate, discover photo evidence of some of the best bathtubs around. For the best experience in a hotel bathtub, don't forget to pack the bubble bath. And if it's a jetted tub, use bubble bath sparingly. The grand-daddy of tubs-for-two, Cove Haven Poconos Resorts is renowned for its heart-shaped bathtubs. 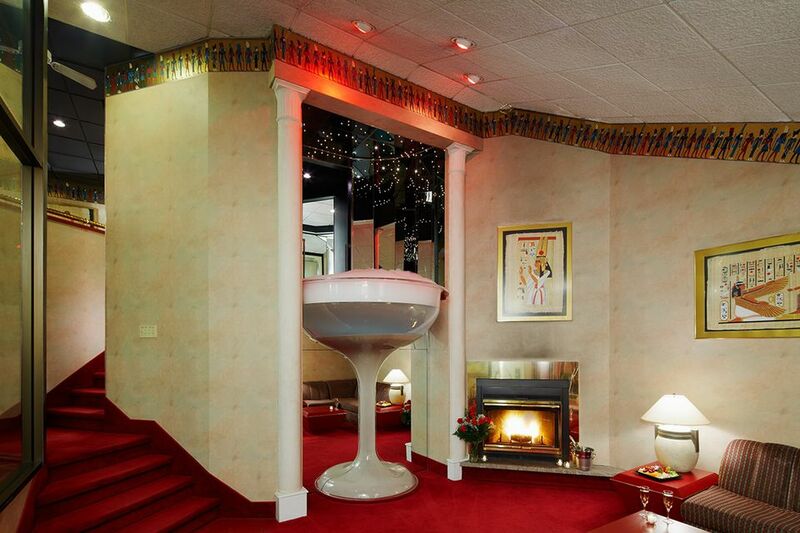 Duos with an even higher tolerance for kitsch can opt for a suite with a seven-foot-tall champagne glass whirlpool bath-for-two. Other units feature a private indoor pool with an adjacent hot tub. Best of the best are the bathtubs at the Colonial House at the Mirror Lake Inn in New York's Adirondacks region. The jetted bathtub is the centerpiece of this large bathroom. Freestanding, it affords easy access from both sides and the spacious room provides both privacy and natural light. After a day of skiing or hiking the 'Dacks, there's nothing like soaking in a warm tub together. Chatham Bars Inn on Cape Cod features large, freestanding bathtubs in some of its cottages. Know how you can tell if a bathtub is designed to be best for two? Its faucet will be centrally positioned or outside the fixture, rather than at one end that threatens to poke one of the bathers. There's only one bathtub this big at Toronto's Soho Met Hotel and it's located in the penthouse overlooking the city. Standard rooms at this hotel do not feature this amenity. Only its penthouse is the tops. In the Los Cabos area, Las Ventanas al Paraiso sets the standard with spacious all-suite rooms and star-style service. The bathroom leads to a private, walled courtyard with its own shower. The bathroom in the Honeymoon Spa Suites at Sandals Royal Plantation in Ocho Rios, Jamaica, contains a large Jacuzzi bathtub for two. A honeymoon suite at Secrets Capri Riviera Cancun is worth it for this outdoor and oversized bathtub alone. Marble surrounds the bathtub at this Cancun all-inclusive resort. Note that this is a feature of the resort's honeymoon suites and not all rooms offer the outdoor bathtub. The Fairmont Sonoma Mission Inn has the best idea of all when it comes to bathtubs: strategically position them close to the bed. Built as a hotel/condo, the Signature at MGM Grand Signature at MGM Grand ​in Las Vegas has oversize jetted bathtubs. The bathtub in a Renaissance Suite at the Four Seasons Florence hotel is more than a place to soak. In the center of the room and framed in marble, this behemoth is the center of attention. Although Queen Victoria is a luxurious ship, the only place where you can enjoy her best bathtubs is in the Grand Suite. Luxurious and romantic, many of the suites at Vancouver's Wedgewood Hotel have bathtubs that comfortably fit two. How far are you willing to travel to take a bath? This one is located in the heavenly Indonesian resort Anantara Seminyak Bali. Little Palm Island is a private resort in the Florida Keys for adults. One of its big bathtubs is inside a freestanding structure. Sink into an oversized round bathtub in a suite at Scottsdale's Hotel Valley Ho. Relatively small in circumference but big in depth, the bathtub at the Roxbury Motel in New York State is part of the enchanting Genie's Bottle suite. The four corners of the multi-story Mandarin Oriental, Las Vegas contain Apex suites, which feature big round marble bathtubs. Standard rooms at the hotel have big bathtubs that comfortably accommodate one person. If you want a big, round bathtub for two like this, you must reserve an Apex suite. In addition to the comfort of the big bathtubs, users enjoy views through floor-to-ceiling windows overlooking Las Vegas. Apex suite bedrooms have two big glass windows so guests can see a panorama of Las Vegas from their king-size bed.